Cash4Coins provide a way for you to exchange foreign coins into Sterling – and the process is fast, simple and secure. Every year we help lots of people change coins back into spendable British pounds which can’t be done at any UK bank. You might think that your bank would be the first place you can find help with your coins, but unfortunately they do not provide this service. This is because of the huge logistical operation involved in sorting, counting and then shipping relatively high weight (but low value) metal back to the country of origin. 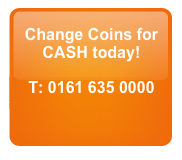 However, the great news is that here at Cash 4 Coins we will change coins for you! All you have to do is package and post us your leftover foreign coins and we’ll then sort and count them. Once this is completed we then e-mail you a valuation offer – if you accept our offer then we’ll send you payment directly to your bank! It’s really that simple…. And what’s even better is that if you don’t accept our offer then we’ll return your coins at our expense – so there is nothing to lose. (This is our 100% satisfaction guarantee). Above certain weights we’ll even collect your foreign coins for FREE – please go to ‘How to send us coins‘ for full details. It really is easy to send your coins to us and we can change coins from any country. Once we receive your coins we will go about counting and sorting these for you – it’s all part of the service and saves you lots of time and effort. We will then send you our best valuation for you to consider at your leisure. If you are happy with our valuation we will arrange for your coins to be exchanged and send you the Sterling by BACs transfer to your nominated bank account. And if you are not happy with the valuation, no problem! We will simply send you back your coins totally free of charge! Collecting foreign coins is also a great way to raise money for your favourite charity, local school or club. Why not get together with friends or colleagues and organise a collection – we’ll change coins for you. We are also the trusted partner for businesses who are looking to change foreign coins that they accept either deliberately or inadvertently. This can include local authorities, museums, attractions, theme parks, airports, airlines, ferry and port operators as well as shops and restaurants – Contact us to today to change coins into cash! If you’d like to discuss any aspect of how to exchange foreign coins, or would like any hints and tips on the best way to organise a collection for charity then we are here to help you. At Cash4Coins we have been offering our customers expert help when it comes to needing to change coins and we would be delighted to extend our help to you. If you have any questions about our service please get in touch with our friendly and knowledgeable team.